An American spacecraft this week successfully reached its target, the asteroid Bennu. The spacecraft OSIRIS-REx is now operating around the asteroid, about 122 million kilometers from Earth. Its goal? To bring back a sample of the ancient space rock for scientists to study. It is a process that will take years. It is the first time the United States has tried to gather asteroid samples for return to Earth. Only Japan has successfully done so. The first step in the process has begun. OSIRIS-REx is now moving 19 kilometers above Bennu’s surface to map the asteroid. It will fly over, around and across the ancient space rock, getting as close as 7 kilometers above the surface with each flyover. Mapping Bennu will help scientists create a more exact model of its shape, its mass and how fast it spins, or turns. They want to know whether there are rocky or smooth areas. They also hope to learn what minerals are on the surface of the carbon-rich asteroid. This information will help the scientists choose the place to grab the best sample of dirt and rock to then bring back to Earth. The American space agency, NASA, sent OSIRIS-REx on the mission to Bennu. NASA hopes to learn more about how our solar system’s planets were formed, and how life began here on Earth. NASA explains that asteroids are what is left of the parts that made up the planets in the early solar system about 4.5 billion years ago. Scientists say asteroids like Bennu hold natural resources like water, organics and metals. Future space trips may need to use asteroids for these materials. After its first mapping of Bennu, the spacecraft will begin orbiting around the asteroid. The spacecraft is set to enter orbit around Bennu on Dec. 31. Bennu is only about 500 meters across. It will be the smallest object ever to be orbited by a spacecraft. OSIRIS-REx aims to collect at least 60 grams of dust and rock from Bennu. The spacecraft will not land on the asteroid to collect the sample. Instead, it will use a three-meter-long arm to briefly touch down and gather particles. This is planned to take place in 2020. The sample container will break loose and head back to Earth in 2021. It is expected to land in the western state of Utah in 2023. Bennu is not the only asteroid scientists are studying. A Japanese spacecraft has been orbiting another near-Earth asteroid since June. That asteroid is named Ryugu. It is about two times the size of Bennu. It is Japan’s second asteroid mission, and it also involves collecting samples. Ryugu’s sample is expected to be back on Earth by December 2020. But, it will be a much smaller sample than what scientists plan to collect from OSIRIS-REx. 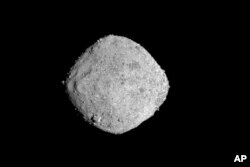 Both Bennu and Ryugu are considered possibly harmful asteroids. They could strike Earth years from now. Bennu may come close about 150 years from now. If it struck, it would create a crater. Scientist Dante Lauretta confirmed that NASA’s work with Bennu will not change its orbit or make it more dangerous to us. The $800-million OSIRIS-REx mission began in 2016. It launched from Cape Canaveral, Florida. As of this week, it has traveled a total of 2 billion kilometers. Anne Ball wrote this story for Learning English with information from the Associated Press and NASA. George Grow was the editor.